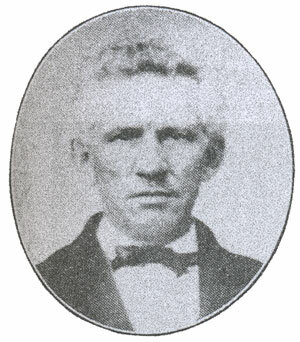 Ruebush was born in Virginia in 1816; his parents were of German descent. He was converted at age 18 and joined the United Brethren church. At age 25, he became a minister in Virginia Conference, and for the next 14 years served churches in Maryland, Virginia, and West Virginia. In 1856, Virginia Conference appointed Ruebush to spearhead opening a mission in eastern Tennessee. On April 6, 1856, John, his wife, and their young son headed to Tennessee in a buggy, a journey which took two weeks. He began looking for UB members who had relocated from Virginia, and found 13 of them scattered over a large area. He began preaching, and within a year had formed and 11-point circuit. He preached wherever he could–in schools, a Methodist church, private homes, or in the woods. The believers began praying for a local family that ran a distillery. Within a week, every member of that family had been converted, and the still was torn down. One family member became a United Brethren minister for over 20 years. When the war ended, Ruebush returned. Tennessee Conference was organized in 1866 with 209 members and three ministers. In 1869, Ruebush transferred back to Virginia Conference for the rest of his ministerial career. In the fall of 1881, at age 65, he baptized some people by immersion and then rode three miles home in his wet clothes. He contracted pneumonia and died on December 16, 1881.